It of course seems highly improbable that a dog bite more than a decade prior was the reason for Alfred’s “fit,” particularly as his own brother had been similarly afflicted with seizures. Indeed, epilepsy is known today to have a genetic link. However, Alfred may have had good reason to want to downplay this incident: his brother was committed to an asylum as a young adult and died at the age of twenty-five. Unlike his brother, Alfred seemed able to live out a normal life. Alfred G. “Fred” Adam, Des Moines, Iowa, 1898; image privately held by Jeanette Borich, 2018. “My present invention has for its objects the production of an improved electrical swivel connection adapted to be interposed in a multiple electrical conductor cord, as a telephone or lamp cord to effectually prevent such cord from twisting upon itself and yet form a perfect electrical connection of low resistance. 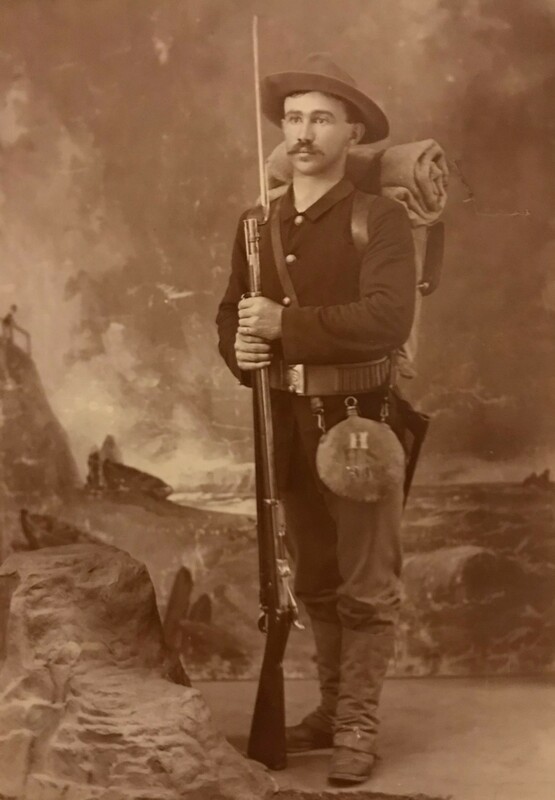 This entry was posted in Uncategorized and tagged 1890s, Adam, antique photograph, family history, genealogy, Iowa, Sioux City, Spanish-American War, vintage photograph on October 30, 2018 by Melanie Frick. On a recent visit to western South Dakota, I flipped through a stack of nineteenth century photographs at an antique shop in scenic Hill City. I had my eye out for any with names inscribed on the backs so that I might have a chance to reunite them with their families of origin, but unfortunately, only two in a stack of a dozen or more were fortunate enough to have been labeled. “May Durkee” read a photograph of a young woman pictured by heaping bouquets of flowers, while the other inscription on a photograph of a young girl caused me to do a double-take: “Emily J. Frick.” Frick is my married name and not terribly common—and although my husband is the immigrant in his family and we know of no Frick relations in the United States, there was no way I could pass up the opportunity to research Emily. Young May made it out of the shop with me as well. Emily J. Frick, Brookings, Dakota Territory, ca. 1889-90; privately held by K.F., 2018. Emily did, however, have a number of nieces and nephews, and I was able to connect with one of these descendants via a Public Member Tree on Ancestry.com.9 Then, her photograph made its way into an envelope and was sent to its new home in Minnesota. Mary “May” Durkee, Alexandria, South Dakota, ca. 1892-93; privately held by S.B., 2018. Although at first glance it seemed to me as though May was posing by a memorial of some kind, the words on the apparent certificate propped among the flowers at her feet read “To Whom It May Concern,” with the header labeled “City of Alexandria,” which does not give the feeling of a tribute. Could this have been an educational certificate? 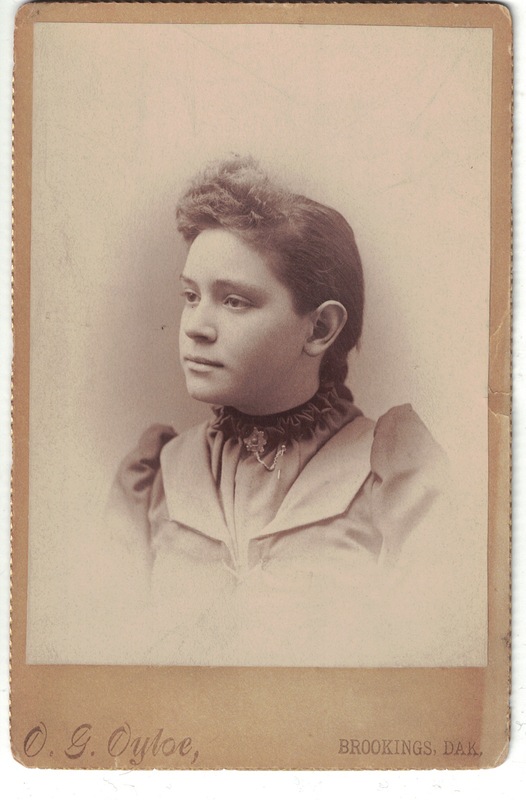 According to a biography held in the South Dakota State Archive’s Pioneer Daughters files, May, who was born in Wisconsin and came to Dakota Territory at the age of two, completed the one-year high school course offered at Alexandria’s brick schoolhouse in 1892 when she was fifteen years old.12 She had to wait until her sixteenth birthday before she was eligible to begin teaching in the local country schools.13 This photograph might have been taken in honor of one of these occasions. May, a young woman with a fair complexion, wears what was likely a white dress with puffed sleeves that rise above the shoulder and are gathered above the elbow. A corsage is at the center of her chest and what appears to be a small book dangles along the side of her skirt, held in place by a sash affixed at her waist. After tracing May’s descendants through obituaries, I contacted a surviving granddaughter who remembered her well and was glad to have May’s photograph mailed to her home in Oregon.18 Thus, happy endings were found for both orphan photographs of these young Dakota pioneers. This entry was posted in Photograph Analysis and tagged 1890s, antique photograph, Dakota Territory, durkee, family history, frick, genealogy, orphan photograph, South Dakota, vintage photograph on July 13, 2018 by Melanie Frick. 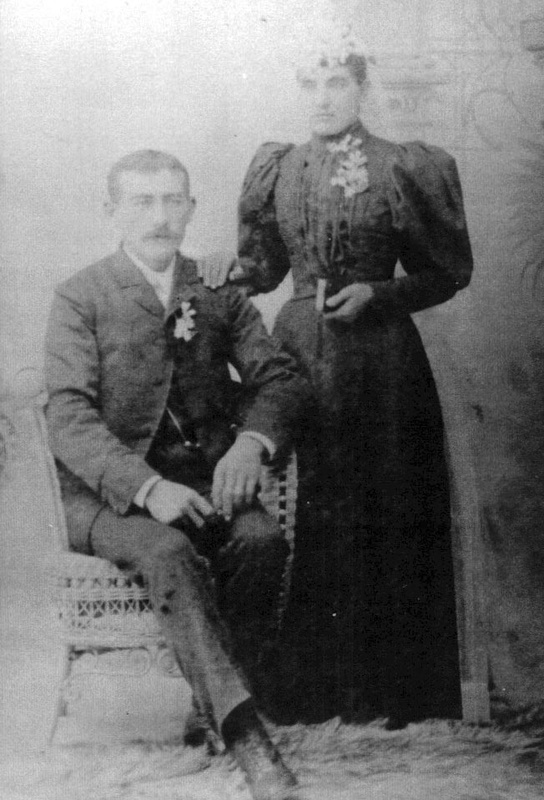 Fred Nielson was twenty-six years old and Christina Marie Schmidt was twenty-one when they married on 08 March 1890 before the Justice of the Peace in Yankton, Yankton County, South Dakota.1 Both Fred and Christina had emigrated from Denmark as children, and for more than fifteen years their families had been neighbors as they farmed less than a mile from each other in eastern Bon Homme and western Yankton counties in southeastern South Dakota.2 Whether the couple first became acquainted as children or young adults is not known, but their first known photograph together, their wedding portrait, survives today. In the photograph, Christina stands in a heavy skirt and bodice, perhaps wool, with contrasting velvet panels on the high collar, cuffs, and bodice. Her hair is styled without the frizzled bangs that she wore a few years prior, and is instead swept smoothly off her forehead. A horizontal pin at her throat appears to match the pin worn in the earlier photograph. She rests one hand on the shoulder of her husband, who is seated. Fred wears a three-piece suit that is rather tightly fitted, as well as a white collared shirt and tie. A watch chain affixed to his vest is also visible. Fred’s hair has been combed and parted neatly, and he sports a small mustache. 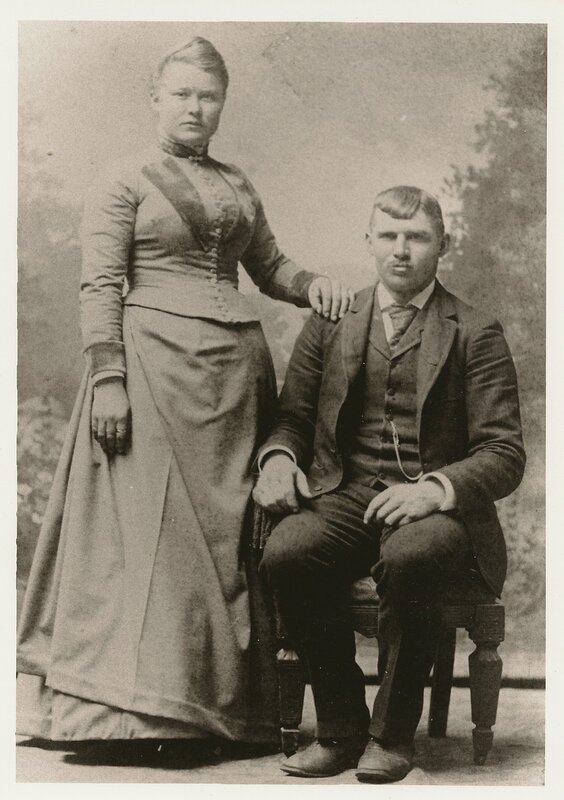 Fred and Christina (Schmidt) Nielsen, South Dakota, 1890; digital image 2010, privately held by Melanie Frick, 2018. Posed before a painted backdrop of a pastoral scene that doesn’t quite reach the floor, the husband and wife look directly at the camera. Both sturdy, fair-haired Scandinavians, their expressions are serious as was typical in portraits of this era. Although this image is a photocopy, it can be assumed that the original portrait was a cabinet card, a style of photograph mounted on card stock emblazoned with the photographer’s emblem that was popular at the end of the nineteenth century. This entry was posted in Photograph Analysis and tagged 1890s, antique photograph, cabinet card, Danish, family history, genealogy, immigrants, marriage, South Dakota, vintage photograph, wedding, Yankton on March 8, 2018 by Melanie Frick. When a casual online search turned up this statement printed long ago in a small-town Iowa newspaper, I was intrigued. There are three generations of Timothys in my family, and all three might have lived near Moville, Woodbury County, Iowa at the time of publication of this issue of the Sioux Valley News on 9 January 1890.2 Which Timothy, then, was sent to the insane asylum? For that matter, which asylum? And why? “Iowa State Hospital for Insane, Clarinda, Iowa (1908),” Prints & Photographs Online Catalog, Prints & Photographs Reading Room, Library of Congress, Washington, D.C. (http://hdl.loc.gov/loc.pnp/pan.6a04897 : accessed 28 March 2017). This entry was posted in Uncategorized and tagged 1890s, Adam, asylum, family history, genealogy, Iowa on March 29, 2017 by Melanie Frick. Henry Joseph Adam, center, Sioux City, Iowa, circa 1903-07; digital image 2010, privately held by Melanie Frick, 2016. As a newlywed in his mid-twenties, Henry Joseph Adam of Sioux City, Woodbury County, Iowa worked as a conductor for the Sioux City Rapid Transit Company, also known as the Sioux City Service Company.3 This photograph, dated circa 1903-07, shows him in uniform, his suit rather baggy on his slight frame and a cap atop his head. Half a dozen men and women pictured behind him are in the process of boarding the streetcar, while three men at the front seem to be investigating an issue with either the tracks or the car itself. 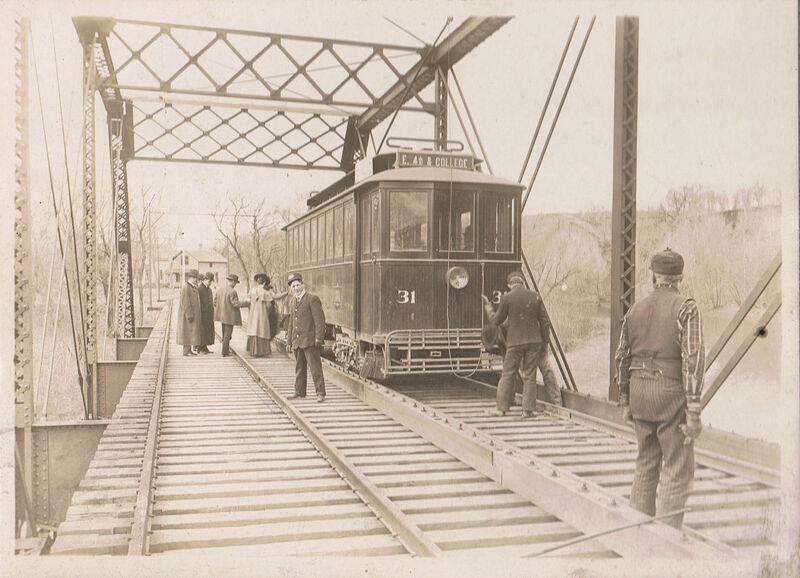 As this seems an unlikely place for passengers to board the car, suspended as they were over the Floyd River, I suspect there was a problem with the streetcar and the passengers had temporarily disembarked, an inconvenience on such a chilly day. That might also explain the occasion for the photograph; the original, mounted on a large piece of cardboard, looks as though it could be a copy of a local press photograph. This entry was posted in Photograph Analysis and tagged 1890s, 1900s, Adam, antique photograph, family history, genealogy, Iowa, Sioux City, streetcars, vintage photograph on January 27, 2016 by Melanie Frick. Well, I did have family in Gypsum, Kansas, a small community in rural Saline County. Pioneers George W. Fenton and his wife Sarah Ellen Hall married there in 1873 and had three daughters – Minnie Belle, Alpha Doretta, and Anna Leota – before George was accidentally shot and killed by his brother-in-law in 1880.2 Sarah later had a son, Charles Alfred, with her second husband, John Hoffman, whom she married in 1883.3 According to the original caption, based on a handwritten notation on the back of the photograph, the individuals were identified as Charlie, Belle, Alpha, and Ota, but their last name was unknown. Could it be…? Charles Alfred Hoffman with half-sisters, from left to right, Belle, Alpha, and Ota Fenton, Gypsum, Saline County, Kansas, ca. 1890-1892; digital image 2015, courtesy of KansasMemory.org, Kansas State Historical Society. Used with permission. All of the children bear a strong resemblance to photographs in my collection that picture them as adults, but this is by far the oldest photograph I have seen of any member of this family. In fact, I had previously seen no photographs whatsoever from their years in Kansas, so this window into their lives is priceless. Gypsum was a rural community of just over 500 residents in 1890; for a photographer to be numbered among its businessmen must have been somewhat significant.11 Kassebaum’s studio featured a somewhat amateur painted backdrop of a parlor setting, a carpeted floor, and animal skin rugs, which created a rather rustic yet elegant setting for the Fenton and Hoffman siblings. It seems possible that this might have been the first studio the children had ever visited. I am grateful to Kansas Memory and the Kansas Historical Society for preserving and sharing this image in their digital repository and for generously allowing me to display it here. If you have Kansas ancestors, this database is well worth a thorough look. Beyond numerous photographs of people and places, I spotted transcribed nineteenth-century journals (how fun would it be to find a mention of your ancestor? ), correspondence, advertisements, and a host of other primary source material fascinating to the historian and genealogist. And if an unidentified photograph happens to pique your interest, consider running a search on the information available as a fellow genealogist did for me – you never know when you might run into a descendant seeking those very ancestors! This entry was posted in Photograph Analysis and tagged 1890s, antique photograph, cabinet card, family history, Fenton, genealogy, Hoffman, Kansas, vintage photograph on December 14, 2015 by Melanie Frick. Mathias Noehl and Elizabeth Hoffman, wedding, North Washington, Iowa, 1896; digital image 2001, original held by J.H., 2015. A copy of Mathias and Elizabeth’s wedding portrait was shared with me by a relative; I suspect the original is a cabinet card photograph, popular at the turn of the century. I can’t make out much of the setting (is it grass or a rug at their feet? ), but Mathias sits in a wicker chair while Elizabeth stands to the side, her right hand on his shoulder. In her left hand is clutched a small book, perhaps a prayerbook. As was typical of the time, neither of the newlyweds smile, and their faces are so faded in the copy that it’s difficult to see the direction of their gazes. Mathias has short hair; in his memoirs, he wrote that that, upon meeting Elizabeth, his blond hair was “unkempt like dried up flowers of the cemetery,” so a haircut may have been in order!7 He has a tidy mustache and wears a wool suit and white shirt. At twenty-eight, having recovered from an earlier heartbreak during his first years in America, he was prepared to settle down and start a family.8 Mathias and Elizabeth would go on to raise nine children on their farm. This wedding portrait is one of several photographs that I have in my digital collection of the family of Mathias and Elizabeth (Hoffman) Noehl, both immigrants who came to Iowa from Germany in the late nineteenth century. For more photographs of the family of Mathias Noehl (1868-1950) and Elizabeth Hoffman (1869-1957), check out my new Noehl Family Album. 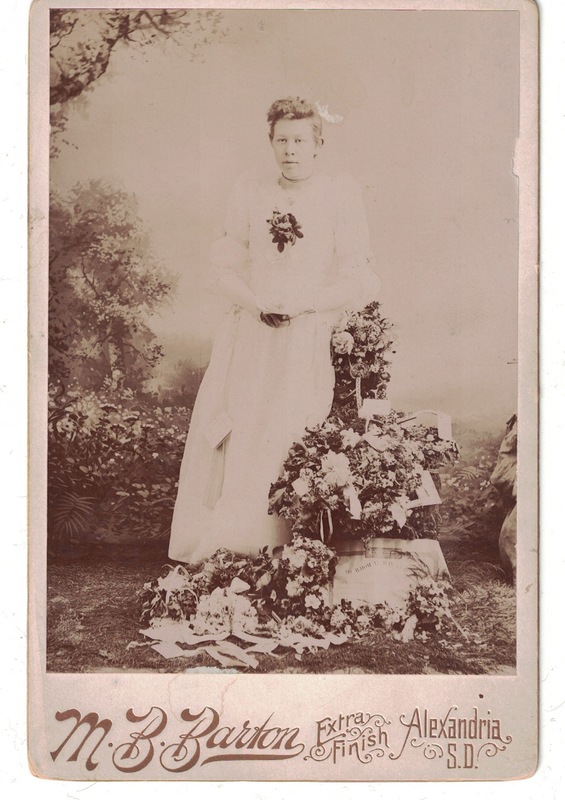 This entry was posted in Photograph Analysis, Wedding Wednesday and tagged 1890s, antique photograph, cabinet card, family history, genealogy, Germany, Hoffman, immigrants, Iowa, marriage, Noehl, vintage photograph, wedding on September 30, 2015 by Melanie Frick.